One band. Three nights. Three Thousand fans. From Fifty Two countries. Marillion Weekends have become a tradition amongst the fan base, “the family”. The main Dutch weekend (there are two others in the UK and Canada) sold out within hours of the tickets being released. It may have been the fifth time the band had put on such a spectacle in Port Zelande, but in a whole host of ways for the 2015 edition, the bar had well and truly been raised. This time, our brief extended beyond ‘just’ the concert film coverage, to include the creation of content for the concert screens, as well as producing and filming a feature documentary about the band and this unique event. Working in close partnership with the band’s lead singer Steve Hogarth, and their graphic design genius, Simon Ward we orchestrated a green screen shoot, and a more traditional ‘live action’ shoot which became the backdrop for the Saturday night rendition of the band’s well-loved ‘Marbles’ album. We also created screen content for the Sunday night too – weaving together elements of archive stills and footage alongside animated album artwork. We also ‘upped the ante’ when it came to the concert films themselves. All three nights were filmed for release – promising an amazing product with the concerts themselves, plus the opportunity to create some top quality bonus material to set the live gigs in context. We handpicked and worked with an incredible and talented crew, which has made sure that concert footage we captured this year has surpassed all others. The three-concert film box set ‘Out of the Box’ was released in December 2016, to following the band's album success with FEAR, earlier in 2016. ‘Marbles in the Park’, the standalone film of the Saturday night gig, is being released worldwide in Q1 2017 though Ear Music. But three concerts filmed back-to-back wasn’t enough! 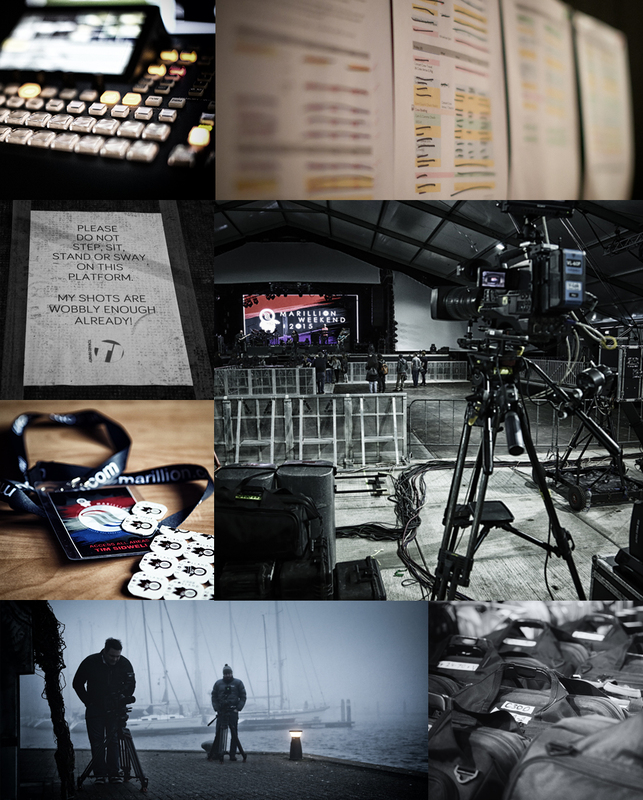 Marillion also commissioned us to develop and film a feature documentary; A behind the scenes look at this amazing event from the bands’ eye view. A unique insight into a band that have been doing their thing for 35 years, and who are still breaking new ground. ‘Unconventional’ was released in November 2015, with a marketing campaign consisting of two teaser trailers, a release trailer and 4 sizzle shorts released on social media the month following the release to really engage with Marillion’s enthusiastic fan base. The documentary has been brilliantly received by fans and critics alike, with a raft of positive reviews, and had its world premiere screening at Toronto’s Reel Indie Film Festival in November 2016. You could say that this project is multi-faceted … an exercise in project management on a pretty big scale, across a multitude of ‘mini projects’, all culminating in an unforgettable three nights of music with the most incredible bunch of devoted fans. The magic still very much appeared to be there, both in the bands performance and the crowd’s reactions to them. There were some very special moments, clearly treasured by those who attended. We look forward to being able to share them (and much else besides), and play our part in bringing Marillion and what they do closer to the wider audience that the band so richly deserves. All material ©2019 Toward Infinity™. All rights reserved.